The Mid-Atlantic Gateway presents . . .
Richmond surely had stronger cards from top to bottom than this lineup on July 14, 1978 at the Coliseum. However, I was never at a Richmond card where the crowd was as insanely wild as this one was. Or at a card that had more excitement generated from its buildup. Let's be honest; one match and one match alone on this card created all of this excitement and anticipation. Typically, a "one match card" would not be enough to crack the Top 15. However, this was not just any match---it was Ric Flair versus Blackjack Mulligan. The promos for the match always led in with the phrase "The Match The Fans Have Asked For." What a huge understatement that was. For three years, from early 1975 to early 1978, Flair and Mulligan had become the best of friends and dominated the "bad guy" side of the Jim Crockett Promotions main event ledger. For so long, these two were inseparable. And they were equally hated by the fans, as the 1976 Mid-Atlantic Gateway Year End Awards point out, with Flair and Mulligan ending up in a flat-out tie in the Most Hated category. However, in October of 1977, some major cracks started to develop in the Flair-Mulligan relationship. Mulligan lost his prized United States Title to Bobo Brazil in July of 1977, and Flair would soon thereafter take the U.S. belt from Bobo. Mulligan went to Japan to get his "head together," and upon his return in October amazingly said he wanted his title back even though Flair was wearing the U.S. strap. Even more amazingly, the promotion then set up U.S. Title bouts between these two bad guys in late October 1977. Richmond's match of all matches, a U.S. Title bout between Flair and Mulligan, was set for October 28, 1977 in the Coliseum. Funny thing happened though; the match never took place as scheduled. Ricky Steamboat beat Flair for the U.S. belt the week before the Richmond match, and Steamboat, rather than Flair, wrestled Mulligan on October 28, 1977. As it turned out, Flair and Mulligan would meet in Richmond-it would just take about six more months. In the intervening six months, there were a few subtle signs of a Mulligan "good guy" turn in the early part of that period, but Blackjack wrestled as a bad guy until the infamous "hat and robe" incident that occurred on Mid-Atlantic Championship Wrestling Television in April of 1978 in the WRAL TV studios. At the time Mulligan (who had regained the U.S. Title from Steamboat in early 1978) had just dropped the U.S. Title to "Mr. Wrestling" Tim Woods and Flair quickly upended Woods for the Title. Flair had been goading Mulligan over his losing to Woods, and told Blackjack that he was a loser and was "over the hill." These comments led to a confrontation between Flair and Mulligan, with Flair coming out later during Mulligan's TV match and tearing up Mully's cowboy hat given to him by Waylon Jennings. 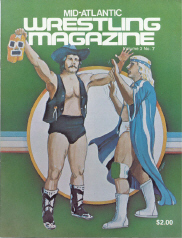 Mulligan would even the score when Flair came out later for his TV match. Mulligan came to the set wearing Flair's favorite peacock feathered ring robe and proceeded to rip it to shreds. Flair went ballistic. Mulligan immediately became the area's premiere good guy, and Flair refused to wrestle him. Instead, Ric put a $10,000.00 bounty on Mulligan's head. For three months, Blackjack battled a slew of Flair's bounty hunters, including Greg Valentine, Baron Von Raschke and the Masked Superstar. 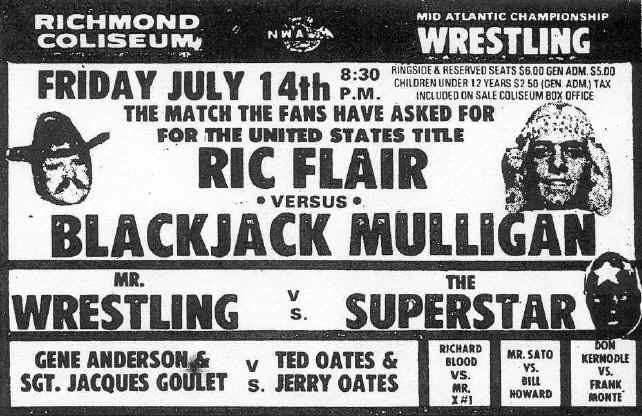 Finally, in late June of 1978, Mulligan finally got Flair hot enough to sign for a one on one match. Blackjack came on Mid-Atlantic TV and told the viewers that he and Flair owned an expensive van together. Mulligan then proceeded to bring out a number of very personal items that were in the van that he said belonged to Ric. Flair was incensed, saying his personal life was private and that Mulligan had crossed the line. Yelling and screaming, Flair agreed to wrestle Mulligan in a single match for the first time. Truly, this was the match the fans had asked to see. The challenger Mulligan came to the ring to a rousing ovation. Indeed, the applause seemed like it would never end. It was several minutes before Flair made his way to the ring carrying the U.S. belt. The response to Flair was as derogatory as one could imagine. Before getting into the ring, the "Nature Boy" got on the house mic and insulted Mulligan and the crowd repeatedly. As if the crowd needed any more reason to hate Flair, he gave them more. Debris was already being thrown towards the ring, and the match hadn't even begun. This was going to be a wild bout! Flair was extra slow taking his robe off. Mulligan was amazingly patient. After the bell finally rung, Ric got on his horse and continued to avoid locking up with Blackjack. The "Nature Boy" spent an inordinate amount of time on the outside of the ring. The crowd was howling, as Flair continued to get on the house mic and insult the fans. Flair made the first mistake of the match, when he spent too much time jawing with a ringside fan and Mulligan nailed him from behind. Blackjack threw Flair into the ring and Ric begged for mercy. Mulligan would have none of it. The match finally was underway! Mulligan dominated the early part of the in-ring action. There was little wrestling involved. Mulligan went to closed fists and outright chokes early on. There was also a lot of activity on the floor around ringside. Flair mounted virtually no offense early on, and the huge crowd loved it. Mulligan posted Flair, and the Nature Boy became a bloody mess early on. Mulligan was giving the crowd what they had come to see-a complete beat-down on Ric Flair. No one seemed to care about the fact that this was also a title match. Midway through the match, Flair was able to mount some semblance of offense by hitting Blackjack with a low blow. Ric capitalized and controlled the match for the next five minutes or so, and popped Mulligan open with a straight right hand to the head. Mulligan bled, but came nowhere close to the blood loss Flair was experiencing. Nevertheless, Flair was inciting the fans by pointing at Mulligan's wound and laughing. Blackjack appeared on his way to victory at around the 20 minute mark when he turned the tables on Flair during a whip across the ring and hammered Ric with a hard elbow to the head. Flair appeared to be out, and Mulligan immediately went to his famed claw hold. The lights appeared ready to go out for the Nature Boy, and a new U.S. Champ was ready to be crowned in the big man from Eagle Pass, Texas. However, from this point forward the match went from wild to insane. Flair's buddy, the Masked Superstar, hit the ring and immediate bedlam ensued. Superstar broke Mulligan's claw, and his interference drew an immediate disqualification on Flair. Mulligan won the match, but Flair kept the U.S. Title. Flair and Superstar double-teamed Mulligan and the crowd rushed the ring like an out of control stampede. I saw three people with knives approach ringside with what looked like very evil intentions. There were so many fans around the ring I didn't see much else from this point on. Obviously, Mulligan regrouped as by the time I could see anything he was standing in the ring by himself with his hand raised in victory. Nobody who saw this match could forget the raw emotion that filled this bout from beginning to end. The first singles match between Flair and Mulligan was worth the wait. It was a match I got exhausted just watching, and it gets my vote for Richmond's wildest match ever. Forget the wrestlers, I was happy to walk out of the building myself in one piece after this bout! This was an intriguing matchup of masked men, and one that was a worthy lead-in to the monster main event match that would follow it. This was the only singles bout these two masked stars would ever have against each other in Richmond, and it was a memorable one. There was no ongoing feud between these two at this point, but the mask versus mask aspect of this match made it something special right off the bat. Woods made it clear in his promos that even though he was wearing a mask now, everyone knew what he looked like. But this was not the case with Superstar, and Woods vowed to go after Superstar and unmask him. Mr. Wrestling said he despised Superstar for being Flair's primary bounty hunter against Mulligan. The styles of these two could not have been more different. Predictably, Mr. Wrestling stuck to scientific wrestling, and was impressive early on. However, for every scientific hold that Woods used, Superstar was able to counter it and seize an advantage with a roughhouse tactic. Superstar threw Woods outside on the floor, and was able to cut Mr. Wrestling on the forehead. The top of Mr. Wrestling's white mask became red underneath. After this episode, Superstar controlled the middle portion of the bout. Mr. Wrestling did muster up a good flurry of offense, bashing Superstar's head into the turnbuckle and then weakening him with an extended application of the abdominal stretch. Woods then made his play for Superstar's prized mask, and got the lower portion of the mask pulled up around Superstar's mouth area. Superstar went berserk as Woods was messing with his mask, and caught Woods with a low blow just as it appeared Woods would get the mask completely off. Several minutes after softening Woods up, Superstar gave Woods a vicious clothesline. With Woods knocked silly, Superstar followed with his famed cobra submission hold. Somewhat surprisingly, Woods arm dropped on the third time it was raised and the referee awarded the match to Superstar on a submission. A clean win by the "bad guy" masked man. This was an excellent bout between the top two mid-card teams in the area at this time. It was a battle between youth and experience. It was also a crossroads match of sorts, as the young Oates brothers were getting a decent push from the promotion at this time. Anderson and Goulet had the bigger names from the past, but this was not a team that was upwardly mobile at this point in mid 1978. The bad guys overwhelmed the Oates' with their rulebreaking in the early stages. Soon thereafter though, the Oates' were able to show Anderson and Goulet what a well-oiled tag team machine they had become. By the end of the bout, the Oates brothers were running circles around their older opponents. Stamina appeared key in this bout, and the Oates' possessed far more of it than did Anderson and Goulet. Chalk one up for the young lions-the Oates' prevail in an impressive and entertaining bout. Bill Howard bested Mr. Sato in a match I best remember for Howard raking the eyes of Sato so many times it was almost comical. Every time Sato went on the offense, Howard grounded him with this most basic maneuver. But, on this night, it was enough. Two long time Mid-Atlantic veterans, Don Kernodle and Frank Monte, hooked up in the second match. As these two had wrestled against each other many times in the past, familiarity must have bred contempt as these two really went at it. While Monte was starting his foray into bodybuilding at this time and looked to be the superior athlete, Kernodle tied him in knots in the end to secure the win in a very competitive match. The curtain raiser between newcomer Richard Blood and Mr. X # 1 was one of the best opening bouts in my memory. Blood showed speed and a great repertoire of wrestling moves. "X" was more of a tag team competitor, but he had just enough dirty tricks to hang with Blood for 20 minutes. This one ended in a time limit draw.